Well, we all knew this day would come: Disney is going to start holding its Marvel titles back from Netflix. 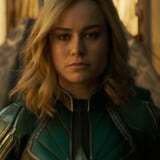 The disappointing but unsurprising move will begin with the next Marvel property on the horizon, Captain Marvel, which the studio will reserve for its own streaming platform, officially titled Disney+. It was already previously announced that the service would include a TV series centered on Tom Hiddleston's Loki, but Disney CEO Bob Iger confirmed on Tuesday that Marvel films are also going to be exclusive to Disney+, starting with Captain Marvel, which premieres on March 8. "What we're basically trying to do here is invest in our future," Iger explained, noting that the move is "designed so that long-term this business will become an important part of Disney's bottom line . . . This is a bet on the future of this business." There's still no word on whether this would mean Disney and ABC-owned shows like Grey's Anatomy would also be pulled from Netflix and put on Disney+, but keep your fingers crossed that if they are, it won't happen for a long, long time. (We all know how that worked out for Warner Bros. and Friends.) In the meantime, we suggest watching Marvel movies like Ant-Man and the Wasp and Avengers: Infinity War on Netflix while you still can!